Scientists at EPFL have used a new imaging technique to monitor how glucose, our main energy source, is used in the body. Their findings may have great implications for diseases like diabetes. Glucose is essential for the production of energy in our bodies, and its level in the blood must be maintained carefully, especially in sensitive organs like the brain. In our cells, glucose is stored in a molecule called glycogen. But despite the importance of glycogen in disorders like diabetes and hypoglycemia, its distribution and metabolism in the body has remained elusive. Using a novel imaging technology called NanoSIMS – previously used for example on meteorite samples – scientists at EPFL have been able to trace how glycogen is used in cells of the liver and the brain. Their work is being published in Nanomedicine. 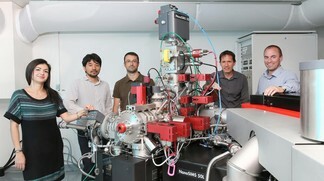 This work represents a collaboration between EPFL (including SB, ENAC, and SV) and UNIL's Institute of Earth Sciences.